Pass 5 and 10 screenings are not nominative, they can be used by one or more people on one or more sessions. Festival Passes, are reserved for the public, and give access to all the projections of the program, in competitions, out of competitions, and the round tables. They do not give access to the FIDLab or the professional video library. Reduced public Passes are reserved for people under 18, students, and unemployed persons . Proof will be required when issuing the badge at the festival. To avoid waiting too long when you arrive at the accreditation office, you can pay now your badge online or send us your payment to “Vue sur les docs” to the address below, before June 30th, indicating on the back the name of the person requesting the pass. Online payment will be available on your visitor page when your badge request has been approved by email. Where to buy my pass ? Given the growing success of the festival and the costs thereby involved, an accreditation fee of 70 euros per personn is requested giving access to all films of the programme, both in an out of competition, FIDLab (July 13-14), round table discussions and the video library. In order to pick up you badge faster at your arrival at the accreditation desk, it is now possible for you to pay it online when your resquet has been approved. For this, please go back to your Visitor Page in the Accreditation menu once your request has been granted by email. This free badge is reserved for the cinematographic press, written, radio or online. Please join us a copy of your press card or recent articles in order to validate your request. The festival reserves the right to refuse any unfounded or undocumented request. Since 2014, FID has changed the process allowing people to register for an accreditation. 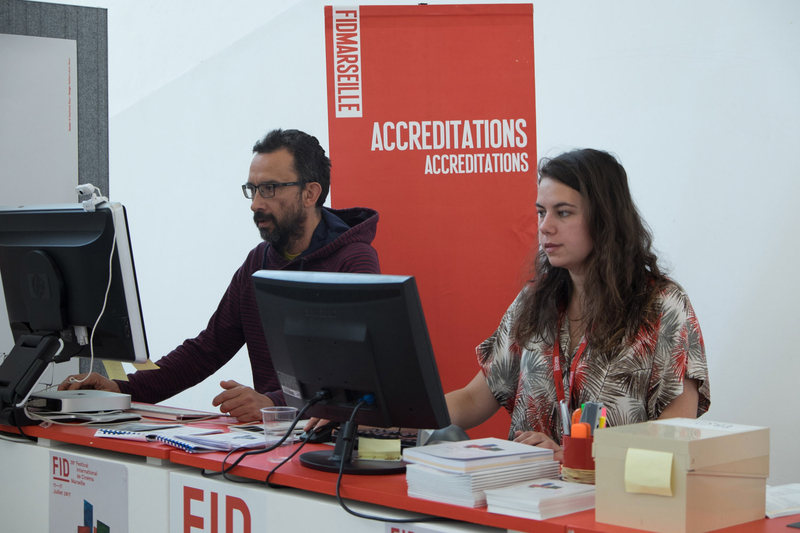 → If you have since 2014 already registered a FIDLab project or a film or asked for an accreditation badge, you can directly have access to your profil, login with your email address and password. → If you have not since 2014 registered a FIDLab project or a film or asked for an accreditation, you will be redirected to a website ( Eventival ) which allows you to manage your business information and your relationship with the festival. All information contained on this site are property of FIDMarseille and will under no circumstances be disclosed to third parties. At first, you must register by creating a user account with your email address and password. This account allows you to establish a secure connection to each visit. A message will be sent to the email address you used to create the account in order to validate it. You can then connect to your Visitor Page with your username and fill in your personal profile and contact information. (If you have a Cinando account, you can log in to Cinando, and import the data from your Cinando profile in your Eventival profile.). The Contact information allows you to fill in your business and personal contacts. If you belong to a company, please try to find if your company is already part of the FID database. After this step, you can access to the Accreditation process. → Your personal profile contains basic information about you. → The Contact information allows you to fill in your business and personal contacts. If you belong to a company, please try to find if your company is already part of the FID database. Please note that each person applying for accreditation must have a personal profile. During the festival, from July 11th to 16th, from 9 am to 10 pm.